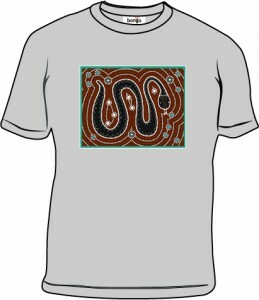 Aboriginal Design T Shirt are a 100% cotton, good quality t-shirts printed with an Aboriginal Snake design. The shirts are available in a great range colours. You can add your own logo. Logos can be added to the back or the shirt or the sleeves. T shirt colours are blue, heliconia pink, green, light blue, sky blue, black, white, yellow, orange, dark grey, light grey and light pink. Minimum order for these t-shirts is 20 units.